What seems like a very long time ago now, way back in August in fact, Tom Lensch offered a number of puzzles through Puzzle Paradise. 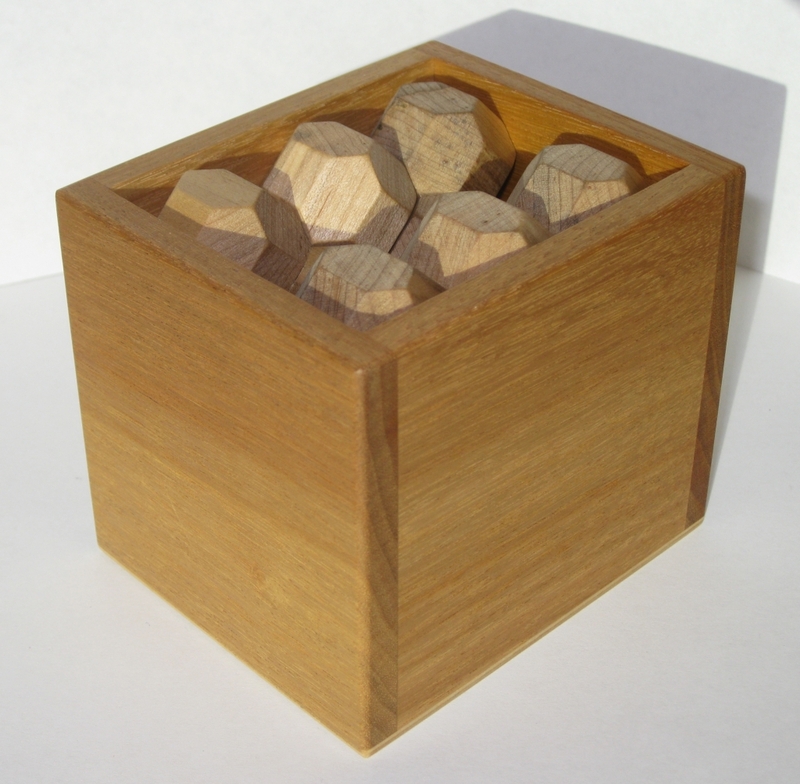 At that time I picked up a copy of the Two Boxes puzzle which I wrote about some time ago, and this Stewart Coffin Design. It's taken quite a while to get round to completing all the challenges set by Stewart for the Distorted Cube, but I've finally done them all, and it's about time I wrote about it! Stewart Coffin first made this puzzle in 1988 in a very limited run of about 8 puzzles, and then again in December of 1996 making around 12 copies. He described it in Puzzle Craft in the 1992 edition, and in the 1996 run produced a puzzle sheet to go with the puzzle. You can see that sheet by following the link here. The puzzle consists of a number of challenges, each of which uses the pieces in a slightly different orientation, which really explores the huge number of possibilities that these four shapes can be combined. One thing I found as I moved from one challenge to the next is that human nature starts to get in the way. As you find one solution, your brain becomes fixated on that orientation, and starts to rule out other possibilities, making finding the solution to the next challenge more difficult. 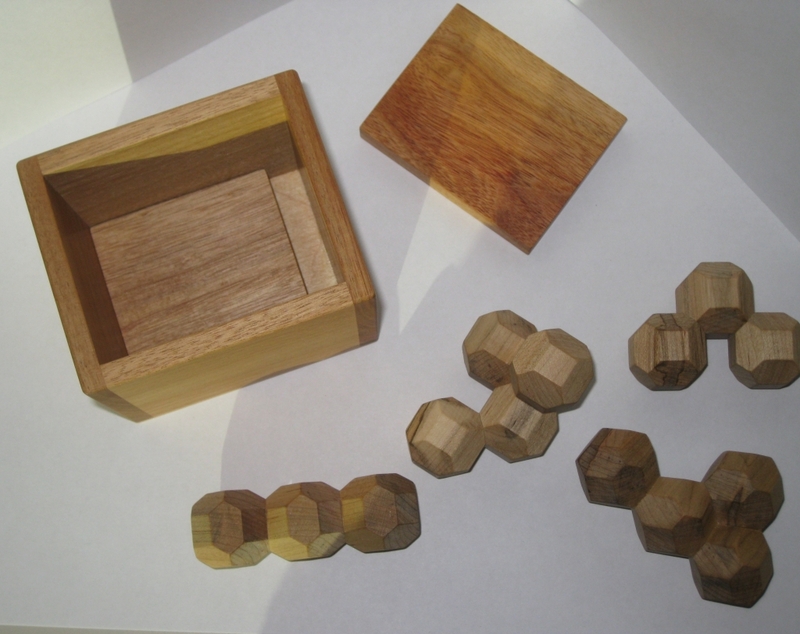 The First challenge is to pack the four pieces into the box so that the cover placed on top of them will be flush with the top of the box. 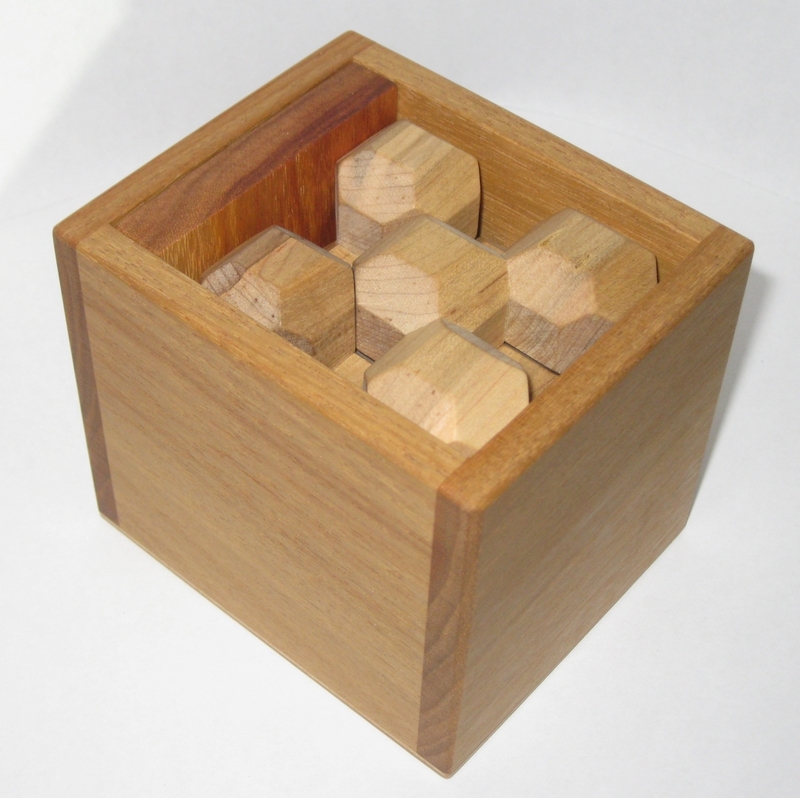 A variation of this is to first lay the cover in the bottom of the box, in which case, the puzzle assembly will be flush with the top. Just so you can tell I wasn't cheating, I went with the latter option. Challenge number 2 is to place the lid into the slot at the side of the box, converting it from a rectangular box, to a cubic box. 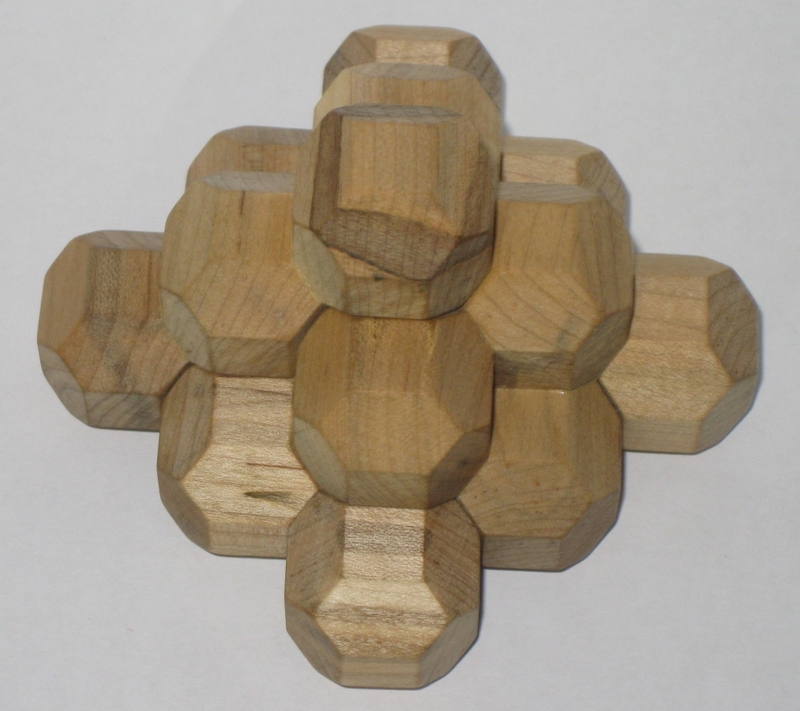 Now place the four pieces into the cubic configuration. Again the top of the assembly will be flush with the top of the box. (No, you're not allowed to have extra pieces sticking out, despite how many combinations I found where this was the case). 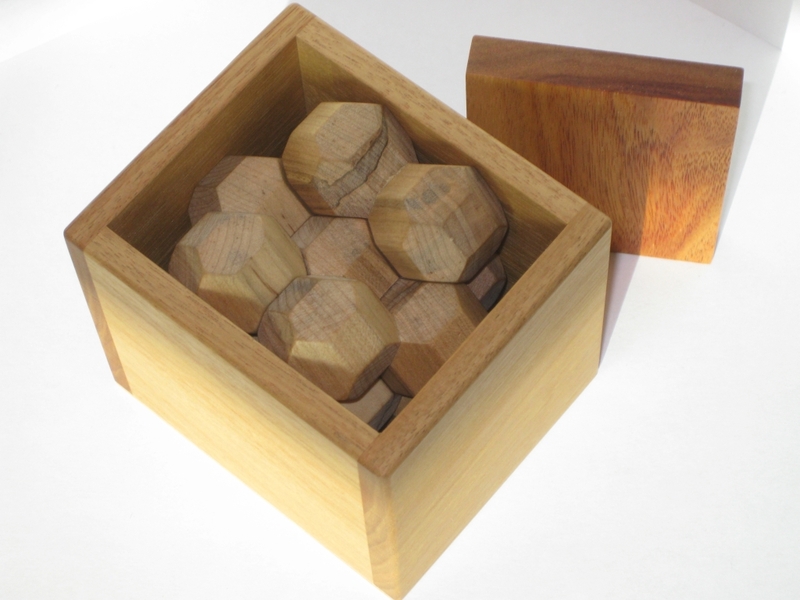 For the third challenge, the cover for the box is put to the side, and the pieces have once again to be packed into the now much larger space so that they are still flush with the sides and top/bottom of the box. This really shows just how many ways there are to make use of the space (or possibly the holes in the cubes) to pack them more or less efficiently, depending on the space you have available. I really love the versatility of this puzzle. What seems like a simple configuration of four pieces allows a lot of different configurations, and as I found many hours of happy puzzling. Challenge number 4 has us making a square pyramidal pile using all four pieces. 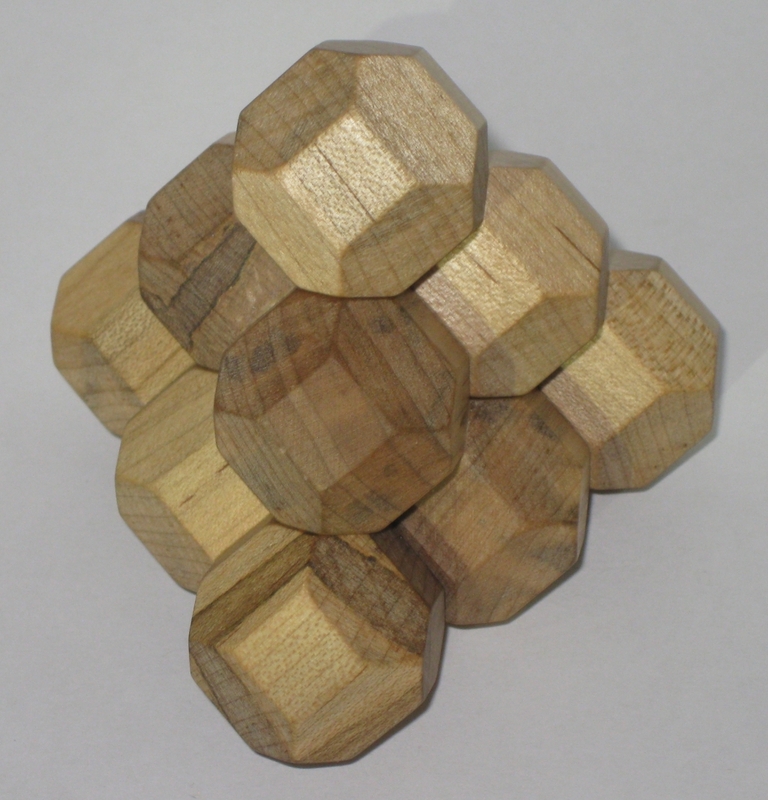 The final challenge that Stewart set is to create a triangular pyramidal pile using only three of the pieces. Of course he's not telling you which three to use. That's up to the puzzler to figure out! Overall, this a great puzzle and I'd highly recommend picking up a copy if you see one for sale. I spent many hours playing with this over several months, and still enjoy going back and re-solving the various challenges. I may even look further into the combination of the pieces to see if there are other combinations possible, as there are certainly some combinations of the pieces which were not used in any of the original five challenges. Secret Base 2 » « The end of a long story that all started with a second of poor judgement.